Through his extensive touring, over 30 million albums sold and his frequent international television appearances, Sir James has endeared himself to millions worldwide. As an instructor and humanitarian, Sir James is a tireless promoter of the arts. Belfast born, Sir James went on to study in London and Paris before embarking on his orchestral career in such prestigious orchestras as the Sadlers Wells & Royal Covent Garden Operas, The BBC, Royal Philharmonic and London Symphonies, before taking up the coveted position of solo flautist with the Berlin Philharmonic under Herbert Von Karajan. Since 1975, when Sir James launched his solo career, he has continuously performed with the world's leading orchestras and conductors, participated in chamber music engagements, popular music concerts and given masterclasses. From Galways' lips have come definitive treatments of classical repertoire and masterworks by Bach, Vivaldi, and Mozart. He also features contemporary music in his programmes, including new flute works commissioned by him and for him by composers such as Amram, Bolcom, Corigliano, Heath and Lieberman. Taking up the baton, and in addition to numerous play/conduct engagements he holds the illustrious position of Principal guest Conductor of the London Mozart Players. Alongside his busy performing schedule he finds time to share his wisdom and experience with the generations of tomorrow conducting annual master classes, commissioning new works for the flute, publishing articles, books and flute studies. His website www.thegalwaynetwork.com is devoted to all students, educators and flute lovers worldwide. A discography of over 60 CDs with BMG Sony Classics, a new range of CDs with Deutsche Grammophon and performing on the sound track of, "Lord of the Rings" (Return of the King), reflects his mastery of musical diversity. Galway was named the 1997 Musician of the Year by Musical America and has received Record of the Year awards from Billboard and Cash Box magazines, as well as the Grand Prix du Disque for his recordings of the Mozart Concerti. His 60th birthday was commemorated with 1999's Sixty Years, a 15-CD retrospective of his works for the RCA Victor Red Seal label. Her Majesty Queen Elizabeth II of England has honored him twice: in 1979 with an Order of the British Empire and in 2001 with a Knighthood for services to music. In 2004, Sir James was given the President's Merit Award from the Recording Academy at the Grammy's 8th Annual "Salute to Classical Music." He has also been honored at the prestigious Classic Brits Awards held in London's Royal Albert Hall in 2005, where he received the coveted "Outstanding Contribution to Classical Music" award in celebration of his 30 years as one of the top Classical Musicians of our time. Visit Sir Galway's website at www.thegalwaynetwork.com. 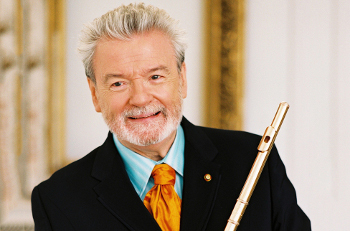 Click here to read Sir James Galway's letter to Indyflute!